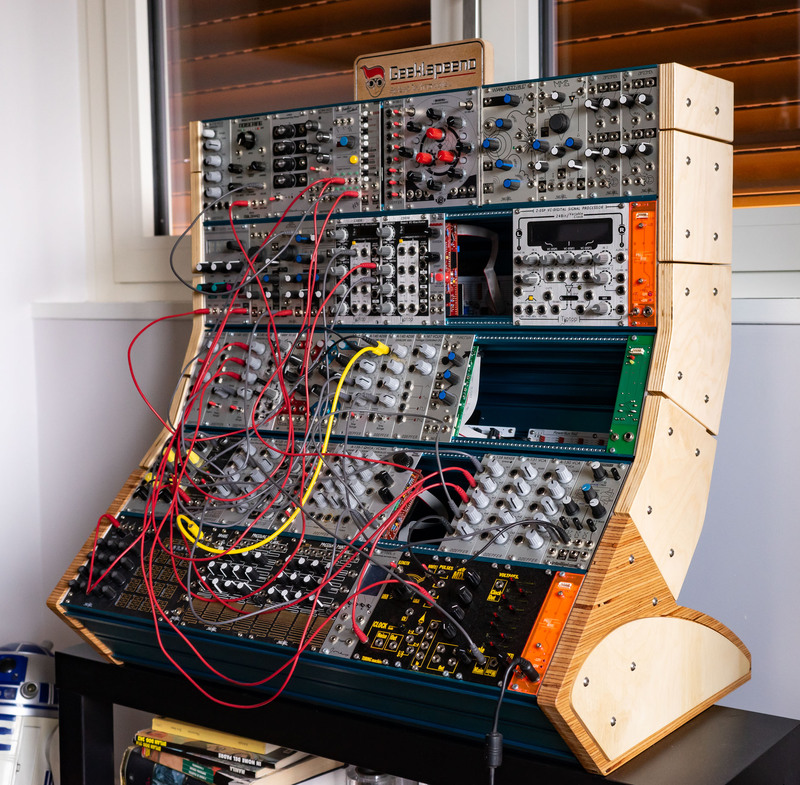 Fraptools Plug: not really "modular"
do you know other similar projects? SynthroTek makes "Cheeks Of Steel" It's really inexpensive. The downside is it only comes as a kit. If you're not handy with an iron and test meters then you'll probably want to pass. But it's around $60US. KAHNCO: dead. As far as I know, it was vaporware. Geeklapeeno, which is similar, was also much talk, no walk. As for the SP-1, it's conceptually interesting. I do have some concerns about a portable case made up of plastic segments being durable in the long-term, though. It would probably be fine as a studio enclosure, though. 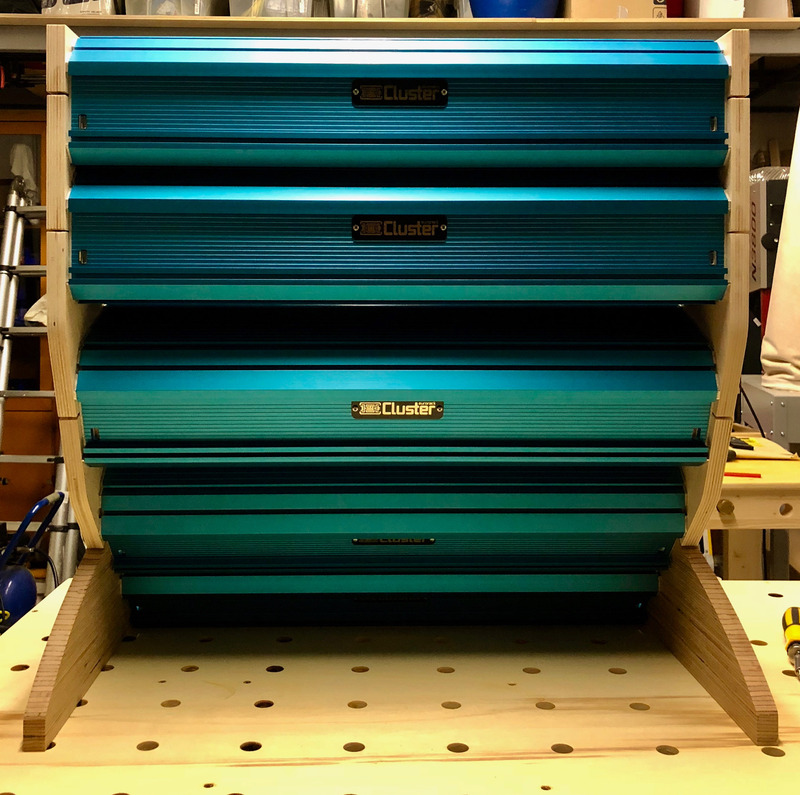 Another idea might be Elby Designs' Construct-a-rack Series cases: http://www.elby-designs.com/contents/en-us/d39.html These come in 42 hp and 20 hp segments, with various options for depth, side panels, mountings, and covers. With these, you do have the ability to build cases with strap-on covers for portability, and the metal construction should prove quite durable over time/use. Geeklapeeno, which is similar, was also much talk, no walk. I have a Geeklapeeno late prototype. It's a beautiful, well thought out enclosure. The Geeklapeeno Cluster is real. I have chatted today with Mr Geeklapeeno and he even showed me new build, non-render models with curved design. And they look awesome. The problem is that his sole point of online reference is that one website for the Cluster system, and it's literally not changed in years...which is why I dismissed it offhand. And I'm sure I'm not the only person who's thought that the project was dead for the same reasons, because when a project goes dark, pretty much what you're left with is a dead website, and the website does look pretty dead. Next time you're in touch w/ Geeklapeeno, you might want to let him know that zero progress reports and info updates on the site over about three years time is really not a good look, and if he's still working on making the Cluster system fly, it would probably inspire a lot more confidence in the product to maintain a lot of interaction there...otherwise, people will view this (as I did) pretty much like KAHNCO. I think he is aware of it. He has a full time job in the maker industry, so on the good side the products are top notch because he has a lot of experience in engineering and construction. Damn, that's pretty...I especially like the look of the base module; the structural and decorative aspects really click there. But yeah, especially if he's going to do something like this, which would effectively pick up the ball that KAHNCO dropped and potentially change the Eurorack cab game quite a bit, he needs to get more info up, start talking numbers, and so on. I note he's got a bit on there about inquiring about distribution/sales agents, but until he can start pitching something concrete, I can't see the various shops beating a path to his door...which they will do once this is ready to hit the door, but given the market saturation in Eurorack now, they're apt to be jinky until/unless something's clearly happening. BTW, about the only other enclosures I can think of on this level, when it comes to internal depth and mounting especially, would be Knurr's DACOBAS Mini Distributor Racks...but since Knurr/Extron only ever deals with industrial or government ISM clients (apparently), getting per-piece pricing info out of them proved impossible when I tried it some months ago. No habla customer service, apparently. Geeklapeeno could literally carve his own niche here, provided he gets onto doing so.